Ammonia Refrigeration is now common practice. This article from Viking Pump discusses safe practices for working with ammonia refrigeration pumps. Ammonia is one of the best known and commonly used refrigerants, and frequently used as the refrigerant in ice plants, food lockers, cold storage warehouses and other industrial cooling processes. This is primarily due to the fact that ammonia has a higher refrigerating effect, per unit of liquid volume, than any other type of commonly used refrigerant. It also has an initial low cost, low pipe friction losses, zero ODP (Ozone Depletion Potential) and zero GWP (Global Warming Potential). Additionally, the refrigeration industry has moved towards more environmentally friendly practices, which makes a natural refrigerant like ammonia even more desirable. Viking Pumps has significant experience with handling ammonia in refrigeration systems and even designed pumps for the specific needs of this liquid. Ammonia is a high vapor pressure liquid and therefore must be kept in a closed container or it will boil away. When working with typical ammonia applications, Viking suggests the double-seal Viking pump 4924A series, whose materials and specifications are shown below, in order to ensure a safe and controlled pumping of refrigerants. First, Viking advises utilizing a pressure relief device that can be “valved off” in any part of your ammonia pump and piping system. The “valved off” feature will provide the essential over-pressure protection that ammonia needs. When isolated, cold liquid ammonia will expand as it warms, which will exert pressures that could rupture the pump or piping without this feature. The “return-to-tank” pressure relief valves should be found on the discharge side of the pump. You want the internal type pressure relief valves installed with the cap pointing towards the suction side of the pump. In any refrigeration system, the proper installation of the pump is critical in preventing hazardous conditions and accidents. For example, sufficient head (at least 4 feet) is a must in order for the ammonia to be delivered to the pump without boiling. Additionally, Viking pumps are of the positive displacement type. Prior to starting the pump, you can be sure that there will be no obstructions in the discharge line and all valves are in proper operating position. While all Viking 4924A Refrigeration Ammonia pumps are thoroughly tested before shipment, we recommend that you pressure test the pump and the rest of the system prior to adding ammonia. Other factors in pump selection include submergence, suction line, insulation, pump speed, system cleanliness, and standby equipment. With these considerations, Viking has the knowledge and expertise to assist you with selection, setup, and operation of your ammonia refrigeration pump. Similar to any chemical, there are potential health hazards that you must be aware of when working with ammonia. Any exposure to ammonia can result in intense irritation to the exposed area as well as the eyes, nose, throat, and lungs. If you are exposed for a prolonged period of time to high concentrations of ammonia, you could lose your sight, suffer burns or even death. The ammonia on the skin can cause a caustic burn, which will vary in severity with the length of exposure and the concentration of ammonia. Due to irritation to the respiratory tract, you can suffer changes in respiratory and heart action. It is extremely important to be aware of proper safety practices and have safety equipment in place when working with ammonia pumps. In fact, only personnel who are familiar with ammonia systems should work on, operate, or be around these pumps. ANSI – American National Standards Institute, Inc.
CGA – The Compressed Gas Association, Inc.
Special Thanks to Viking Pump for this article. Viking Pump, a Unit of IDEX Corporation, is a world leader in the design and production of rotary Positive Displacement Pumps, which are successful in some of the toughest circumstances. Founded in 1911, Viking products are found in a wide-range of industries, from the military, to food and beverage, to chemicals, and fuels and plastics. 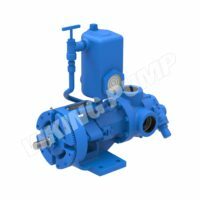 These innovative pumps are reliable and successful no matter what the pumping materials, whether it is hot, cold, liquid, thin, thick, solid, etc. Viking pumps come in a wide variety of pump models, sizes, and composition, but can also be customized to your specific need.